Wash and cut the potatoes into bite-sized pieces. Cover with water and boil until fork tender, about 20-25 mins. Drain and cool the potatoes. Once they're cool, mix the mayo and sour cream. Add the onions, chives, and cheese. Salt and pepper to taste. 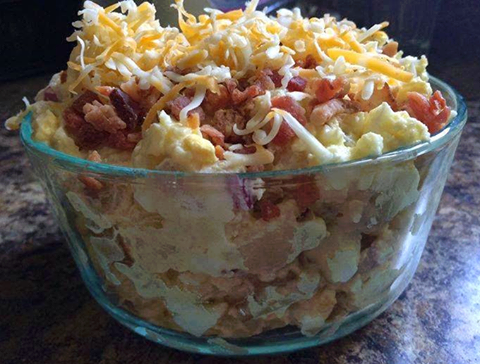 Top with extra shredded cheese and bacon and serve.